No longer living - Bernstein, von Karajan,Solti. Living - Slatkin, Mehta, Levine, Maazel, and Ozawa. Publishers of my music: Boosey & Hawkes Music, Inc., Ballerbach Music, and Roncorp Music Inc. Since the fall of 1988 Roger Garrett has been the full time clarinet professor at Illinois Wesleyan University in Bloomington, Illinois, where his duties include teaching the Clarinet Studio, conducting the Symphonic Winds, and teaching the Fundamentals of Conducting Classes. In addition to overseeing all aspects of the Titan Band between 1988 and 2000, other duties have included teaching Marching Band Practicum, Chamber Music coaching, coaching student for the Titan Band, and 14 years of managing and advising the Illinois Wesleyan University Recording Studio. 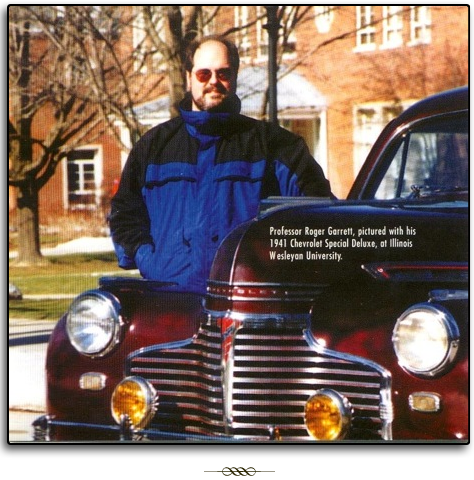 Prior to accepting his position at Illinois Wesleyan University, Mr. Garrett taught instrumental music and general music in the public schools of Longview, Washington, and Bozeman, Montana. Professor Garrett graduated With Distinction from the University of Michigan in Ann Arbor with multiple degrees in Music Education. As part of the Ph.D. Program, his cognates included extensive study in the areas of clarinet performance and instrumental conducting. Professor Garrett has guest conducted throughout the state of Illinois as well as in Oregon, Washington, Wisconsin, Michigan, Ohio, Colorado, and transcontinentally in Sweden. His conducting teachers have included H. Robert Reynolds, Elizabeth Green, Donald Schliecher, and Carl St. Clair. Besides his conducting activities, Mr. Garrett’s wind band editions and full scores have been published by Boosey & Hawkes Music, Inc., Ballerbach Music, and Roncorp Music Inc.
Mr. Garrett began his clarinet performance career at the age of seventeen as a guest soloist with the Oregon Symphony Orchestra. He has since performed within the ranks of several professional orchestras, including the Oregon Symphony, the Ann Arbor Symphony and Ann Arbor Chamber Orchestra, the Illinois Symphony Orchestra and Illinois Chamber Orchestra, and the Peoria Opera Orchestra. He is currently Principal Clarinetist of the Peoria Symphony Orchestra in Peoria, Illinois. A basset horn and low clarinet specialist, Mr. Garrett has performed basset horn trios with members of the Chicago Symphony Clarinet section. He has also performed as a basset horn guest artist with such ensembles as the Milwaukee Symphony and North Carolina (Greensboro) Symphony Orchestra wind sections, as well as with the nationally acclaimed Colorado Music Festival Chamber Ensemble. His compact disc entitled Extended Clarinets!, released by NOViTAS Records in 2000, features Mr. Garrett performing chamber music with clarinetists of the Chicago Symphony Orchestra, former members of the Santa Fe Opera Orchestra, Seattle Opera Orchestra, Oregon Symphony Orchestra, and Eugene Symphony Orchestra. This compact disc includes published arrangements by Mr.Garrett, such as Zwölfen Variations for Three Clarinets and Bass Clarinet (originally for piano) by Wolfgang Amadeus Mozart as well as his setting for clarinet choir of St. Paul’s Suite for String Orchestra by Gustav Holst. In 1998, Mr. Garrett was honored by Boosey & Hawkes, then distributors of Buffet Clarinets, by accepting a position with the company as a Buffet Performing Artist. Mr. Garrett performs exclusively on Buffet clarinets. During his 1998 Spring Semester Sabbatical, Mr. Garrett reasearched and studied the design and acoustical properties of clarinet and bass clarinet mouthpieces. Much later, after the sabbatical, he was asked to produce clarinet and bass clarinet mouthpieces for students, friends, and professional colleagues. After a visit to The Woodwind and The Brasswind and a request by then owner, Dennis Bamber, Mr. Garrett made his mouthpiece designs available to the public. Since that time, Mr. Garrett has become well known for his custom-made clarinet and bass clarinet mouthpieces - many of which are used in professional orchestras throughout the world. His mouthpieces are currently used in the Metropolitan Opera Orchestra, the National Symphony Orchestra, the Cincinnati Symphony Orchestra, the Mexico Symphony Orchestra, and many other notable full time professional ensembles including the Marine, Army, Air Force, and Navy professional bands. An avid woodworker, Professor Garrett’s hand made, reed cases for clarinet, bass clarinet, oboe, bassoon and contrabassoon are currently offered in several international music supply catalogues and in stores across the United States. His custom made conducting batons, created individually in his shop at home, have been purchased and used by professional conductors across the United States, England, Canada, Germany, Australia, and China, and are used by university students in conducting classes throughout the United States.